Switzerland - IOM reports that 31,993 migrants and refugees entered Europe by sea in 2017 through 9 April, with over 80 percent arriving in Italy and the rest in Spain and Greece. This compares with 172,774 through the first 97 days of 2016. IOM Rome spokesperson Flavio Di Giacomo reported yesterday (10/04) that over 2,100 migrants rescued last week have been brought to Italy since IOM’s last report. Among them were over 500 Bangladeshis and around 50 Syrians – the rest, mostly sub-Saharan Africans. Among the Bangladeshis and Syrians, Di Giacomo said, were many who had resided either in Libya or Egypt for several years. Many others were reported to have recently left Turkey to make their way to Libya via Sudan. Di Giacomo said figures from Italy’s Ministry of Interior indicate over 11,000 migrants arrived in Italy via the Mediterranean in March, more than the number arriving in either March 2016 or March 2015. Roughly 27,000 migrants this year have left Libya for Italy through the year’s 99 days – that’s over 7,000 more than the number arriving through the same period last year. Arrivals to Greece remain low – just over 300 thus far through April, and 4,107 since the beginning of the year. In 2016, during the same period, 150,000 migrants and refugees had entered Greece via sea from Turkey. 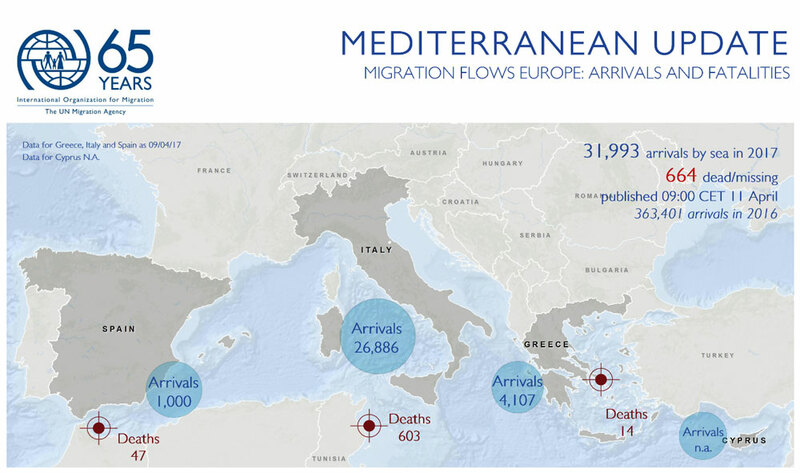 Deaths on the Mediterranean through 9 April total 664, almost 90 percent being recorded on the Libya-to-Italy route. During the same period, last year, IOM’s Missing Migrants Project (MMP) recorded 1,217 – nearly twice 2017’s total – due to the 9 April 2016 incident off the coast of Egypt, where 459 migrants were recorded drowned or missing. Worldwide, the IOM Missing Migrants Project reports that there 1,183 fatalities through 9 April (see chart, below), with the Mediterranean region accounting for the largest proportion of deaths – over half of the global total. This is just under 1,000 fewer fatalities than were reported at the same point in 2016. However, these data do not account for full reporting from North Africa and the Horn of Africa, two migration corridors where data collection tends to be slower than in other regions.